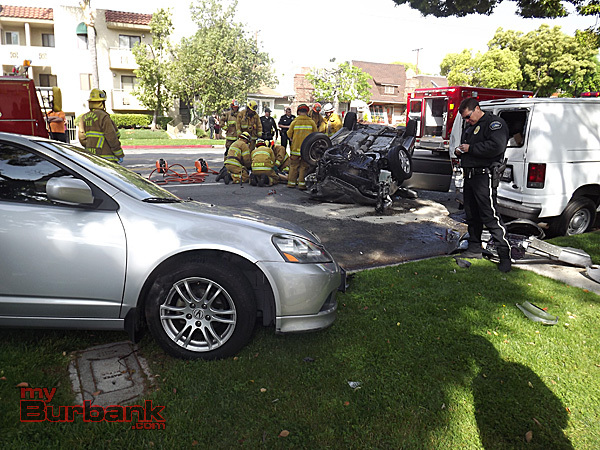 Around 9:20 Tuesday morning, Burbank Fire and Paramedics and Burbank Police were dispatched to a traffic collision with a vehicle overturned and a person trapped inside on the 300 block of N. Hollywood Way. Burbank PD arrived on scene and began to shutdown Hollywood Way in both directions between Heffron and Oak as cars struck in the collision were scattered on both sides of the street. 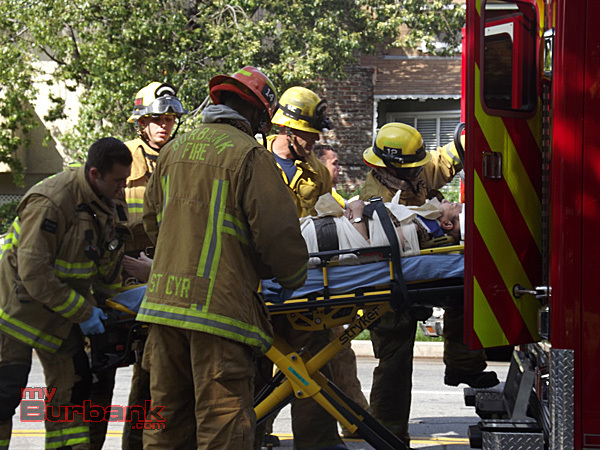 Shortly after, Burbank’s Engine and Truck 12 arrived on scene to find one vehicle on its roof in the street that had struck multiple other cars, and an unconscious but breathing female trapped upside down in the vehicle. The driver side door of her overturned car was not very badly damaged allowing for a fairly quick extrication process by the units on scene. After being removed from the vehicle, she was quickly transported to the hospital to be treated for her injuries. There is no word on her condition at this time. Witnesses at the accident scene said the accident was allegedly caused by the female driver, driving a beige sedan, who was traveling northbound on Hollywood Way when she then struck a car in the lane next to her sending that car spinning across the street and onto the sidewalk. The driver of the beige sedan then hit two more parked cars on the northbound side of the street before rolling over and landing upside down in the street. Burbank Police and Fire are unsure of whether the driver fell suffered a medical condition right before the accident happened, or if she lost consciousness as a result of the violent collision. The driver of the beige sedan was thankfully the only person injured in the accident. Hollywood Way was shutdown for over an hour to allow Burbank PD to conduct a lengthy investigation to provide more clues as to what possibly caused the accident. 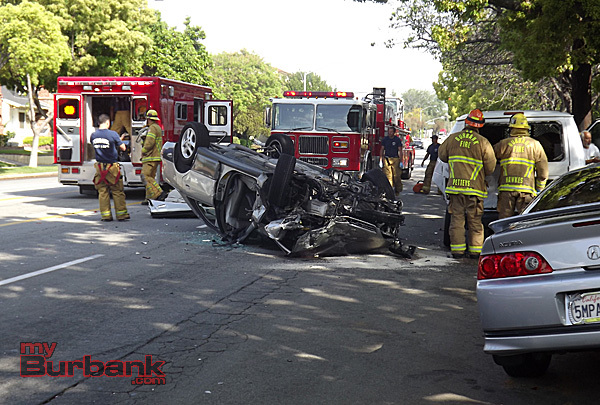 This entry was posted in Fire / Accidents, News and tagged Accident, Hollywood Way, overturned vehicle on April 24, 2013 by Staff.